The base is made up of two sections. 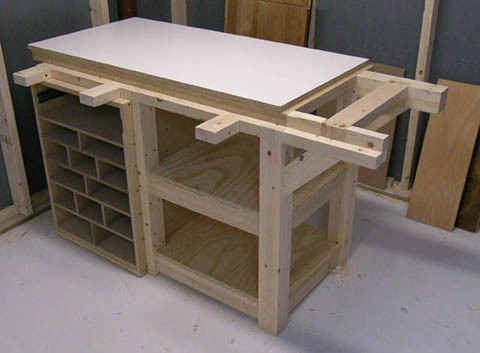 To the left is an MDF cabinet for one large drawer and a lot of small but deep cubbies. 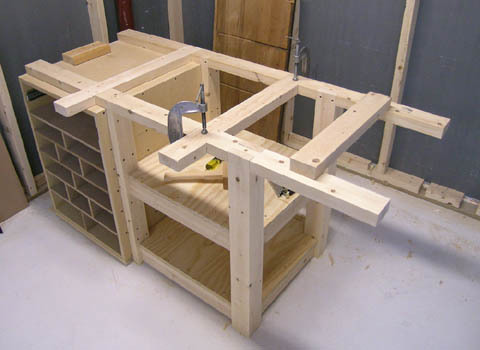 All the internal divisions made the unit able to resist racking without having a back. I am using these for scrap wood storage for the time being, but they could also hold planes. To the right is an open shelving unit made up of 2x4s that were all cut down to 3" width to allow for square doubled up posts. 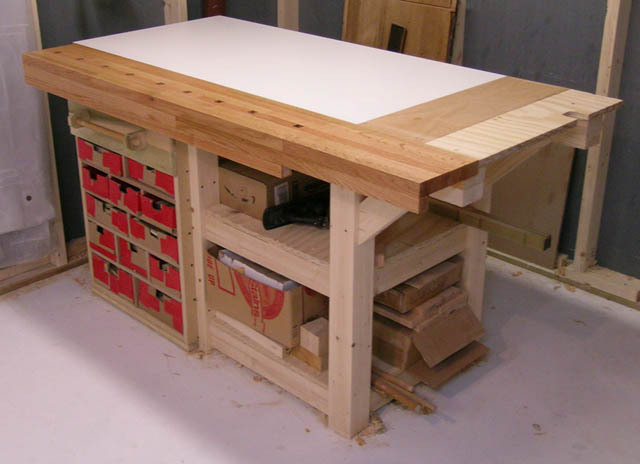 All mortise and tenon joinery, reinforced by the 3/4" plywood shelves. 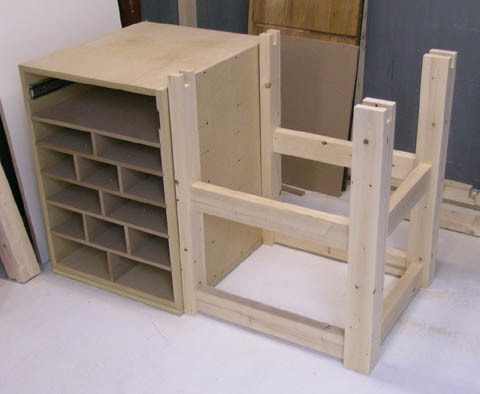 The two units are joined with an obscene number of screws and the half lapped 2x4 top frame. I didn't want to deal with full sheet goods, so the top is built around the 2'x4' panels from the borg. The bottom two layers of 3/4" MDF here are getting glued up. 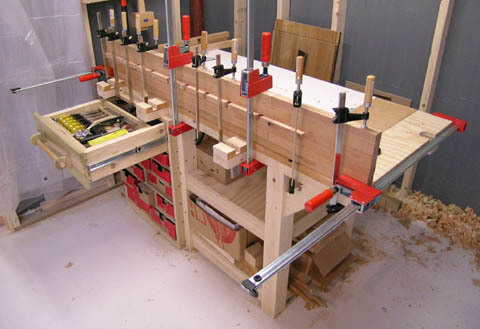 You can never have enough clamps, or apparently drill presses. I ordered a bunch more after this. 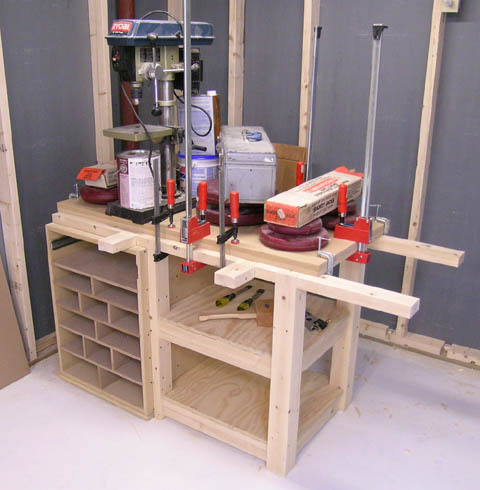 Clamps that is, not drill presses. Also it would have been a good idea to make sure I had enough glue before I started. Just barely made it. Now it's starting to look like something. The top layer is melamine, which after 3 months is holding up well. It's held down by screws from underneath, so if gets too beat up it can be flipped over, and then replaced the next time. The diagonal bracing at the end was an afterthought. Once it was together I didn't like how all the stress was right at the weak point of the frame. They're held in by two dowels into the posts and screws to the top frame. At this end will be disposable plywood. This where I intend to do the nasty stuff, at least until the rest of the bench gets dinged up enough for me not to cringe anymore. I didn't have a large enough piece of scrap ply so it ended up being two pieces. Glue up of the oak front. I was able to get some 1 1/4" square oak at a reasonable cost, which cut down on the number of layers vs using 1x stock. 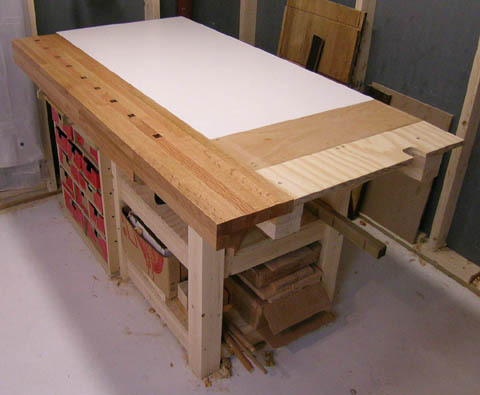 I added a strip of 1x at the dog holes before cutting the holes on the table saw. Note that I glued this up one row at a time, not all at once. 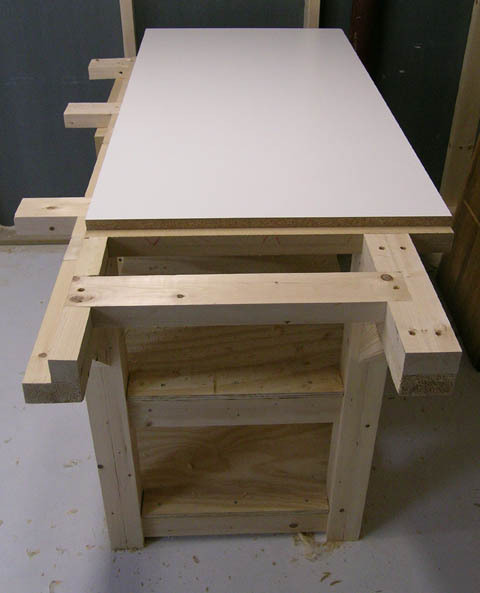 I used dowels for alignment of the first two rows, after that it's jsut glue. If you don't go crazy with the glue it's not that hard to line them up. The drawer of goodies. This was my first dovetails, cuts done on the bandsaw then chiseled the waste. The drawer came out decent enough, the inner tool tray is horrible. I don't even know what's keeping it from falling apart they were so loose. You can't tell from the picture, but the middle divider of the tray has a cutout to serve as a handle for lifting it out. 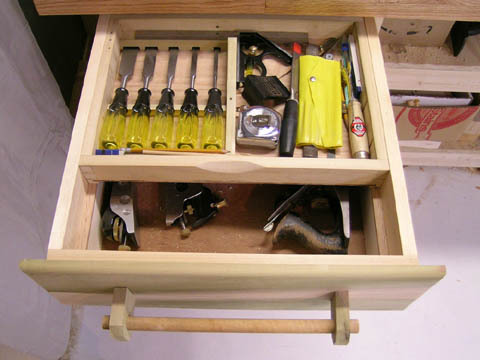 I am sure that how I use this drawer will change over the years as I get new tools. It took me entirely too long to figure out the chisels don't dig in if you put them in bevel down. To hold the scraps I made up cardboard boxes. I suppose I could have found something better than duct tape to make them with, or at least not RED duct tape. Oh well. They seem to work pretty well. I can actually find things now. 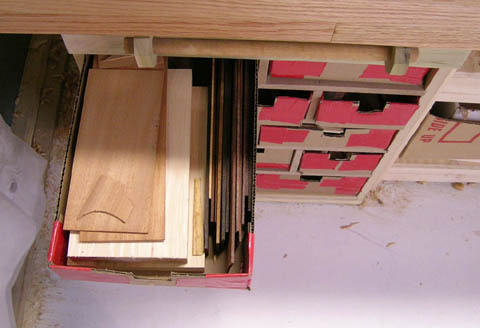 Doesn't do any good to save scraps if they are in a big box that I won't bother to look through. And now you know where my cocobolo stash is. And the near finished bench with a couple coats of shellac on the oak. I've left one piece of the skirt off because I don't have the end vise yet so I'm not sure how deep it's going to end up, I may have to cut it down. I am debating whether it's worth finishing the 2x4 frame. I want to add a base moulding to make sweeping up easier first anyway. 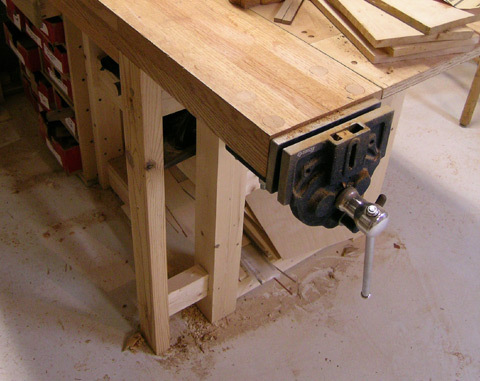 I have a feeling I'll end up adding a dog hole or two closer to the vise. I know if I tried to put any over there at this point they'd end up blocked by the vise. Over a year later and I finally have a vise. I've also added an additional post to help support the oak "front" which was too bouncy so I was using the "back" as the "front" most of the time. It's much better now. The melamine has held up well over the past year.